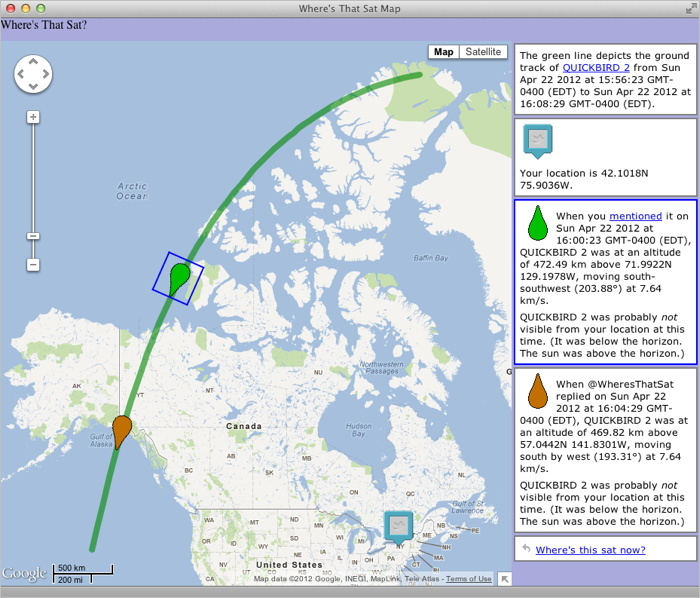 As I’ve mentioned a few times, I’m making a bot called WheresThatSat which is basically a Twitter interface to Ground Track Generator, my satellite-path-mapping program. The bot responds to queries about satellites (it knows of many – you might even say it has detailed files) by reporting their location at the time they were mentioned. My goal is to get things working smoothly enough to let WheresThatSat resume running later this week, at least on a trial basis. Although the bot could search for and reply to any mention of the many satellites it knows about, I’ve decided it will only post unsolicited responses to a sample of tweets about one or two “in the news” satellites (queries explicitly addressed to @WheresThatSat will, of course, have access to a full catalog of satellites). This is partly a matter of manners and partly a matter of avoiding excessive API calls (Twitter imposes rate limits on how frequently programs can interact with it). Posted on Sunday, April 22nd, 2012. Tags: geography, gtg.